Feeding: The Chizer should be fed lightly as they tend to gain weight. They may have a sensitive stomach and be prone to gastric disturbances and pancreatitis. Temperament: The Chizer is playful, happy, alert, sweet, gentle, tolerant, loving, intelligent, bold and saucy. They may tend to snap at teasing children and not get along with other dogs outside of the family, especially if they were not properly socialized at a young age, after all some are too tiny to get away. Since the temperament of this breed can be quite variable, select a puppy from parents whose temperament you enjoy. Family Dog: The Chizer is makes a great family pet as long as you teach them correctly. They are not recommended for families with small children. Shedding: The Chizer is a low to average shedder. Grooming: The smooth, short-haired coat should be gently brushed occasionally or simply wiped over with a damp cloth. Clip out any knots. Bathe both types about once per month, taking care not to get water in the ears. Trim around the eyes and ears with blunt-nosed scissors and clean the whiskers after meals. Training: Chizers are very smart, making training a breeze. They learn the basic commands very quickly but may be difficult to house-train outdoors. Many owners simply paper train their Chizers. 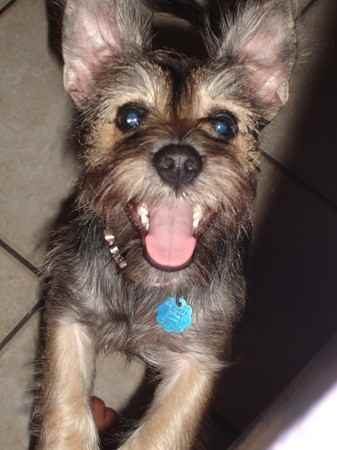 Behavior: Chizers have the high energy of a Schnauzer and the bold attitude of a Chihuahua. They absolutely love to run around and never seem to have enough play time. Chizers are extremely sweet, bright-eyed, intelligent, tolerant and gentle dog even to children. They love to cuddle and give their owners kisses all the time (to the point where you have to say "that's enough!"). They can be a little nervous and shy of strangers and other dogs. They should be well-socialized as a puppy to avoid this and other behavior issues as an adult. Barking: Chizers have extraordinary hearing and bark at the slightest sounds, making them wonderful guard dogs. The Chizer has a very loud and strong bark for such a little body. Weather: The Chizer hates the cold and may shiver when cold. Exercise: Although it is tempting to carry these dainty creatures about; these are active little dogs, who need a daily walk. Physical Ability: The Chizer is able to jump suprisingly high for a small dog. Living Conditions: The Chizer is fairly active indoors and can live happily in small spaces such as Apartments and Studios. They do have high energy though, so a daily walk is highly recommended. Appearance: The Chizer is a tiny dog with large ears. The tail is usually docked. They come in either a long or short coated variety. The dog is more robust than he looks, with a level back, and legs coming down straight and square. Size: The Chizer can grow to be between 6 to 14 inches tall and weigh between 2 to 15 pounds. Companionship: The Chizer makes a great companion as it loves to stay right by your side at all times. They do need to be around people a good deal of the time. They like to keep close to their owners following their every move especially when strangers are present. They make excellent lap dogs. They sometimes develop a mild separation anxiety though. Head: The head of the Chizer can be long, rounded or apple-shaped. Chizer puppies are often born with a soft spot or molera like the Chihuahua which usually closes up with age. Nose: The Chizer has a well-developed black nose. Eyes: The Chizer has large, round eyes. Ears: The Chizer can have large, pointed, erect or longer floppy ears. Muzzle: The Chizer has a short, pointed or square muzzle. Teeth/Bite: The teeth of the Chizer should meet in a scissors bite but they may also have an underbite. Neck: The Chizer has a short neck. Body: The Chizer has a long, lean body and can have short legs or long slender legs. Tail: The tail of the Chizer may be docked or left long and natural. Color: The coat of the Chizer can vary from black and tan to gray and red to cream and white. Coat: The coat of the Chizer is often short-haired but there is also a a long-haired variety. The coat very soft on the head and slightly coarser on the body. Life Expectancy: The life expectancy of a Chizer is around 15 years. Characteristics: The Chizer makes a good watch dog and mouse catcher. Allergies: The Chizer may develop allergies to dog foods containing red meat. When switched to a different food they should do fine. Health: Because of his short nose, the Chizer tends to wheeze and snore. Although some are prone to suffer from kidney stones, liver disease, skin disorders, von Willebrand's disease, diabetes, liver ailments and cysts. Prone to slipped stifle, gum problems, colds, stress, and rheumatism. Eyes of breeding stock should be checked for this. They may have a sensitive stomach and be prone to gastric disturbances and pancreatitis. Ear Health: The Chizer may be prone to yeast infections.